Unlike conventional booking sites, we at LockTrip do not add any commissions on bookings placed through our travel marketplace. As a result, we are able to offer our customers prices that significantly undercut the ones offered by conventional travel agencies. Back in April 2018, we conducted a price comparison analysis regarding 800 randomly selected hotels worldwide. At that time, we already knew that our prices were highly competitive. But we wanted to know about our regional strengths and weaknesses while at the same time backing up our claims with actual numbers. The results were very encouraging. 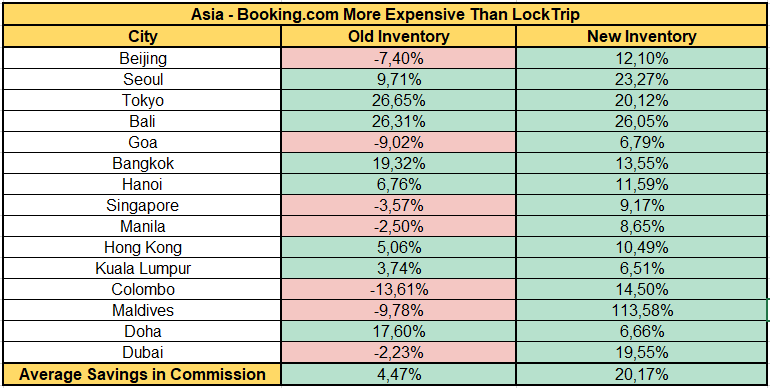 In Europe, Booking.com was on average 17.18% more expensive than LockTrip, while we achieved an impressive 21.81% in the USA. In the region of Asia however, we observed a price difference of only 4.47%. This allowed us to determine our next steps in terms of acquiring additional inventory. We had strong data to base our decisions and efforts on. Since then, we have worked on further improving our competitiveness while at the same time extending our offerings and destinations. The result of those efforts was announced in late 2018 when we shared with you that we had secured additional inventory consisting of more than 400,000 hotels. The integration is going on as we speak. In the meantime, we want to share with you the first fruits of our achievement — our improved rates for Asia! In the table above, you can see the price comparison between Booking.com and LockTrip. “Old Inventory” refers to the 100,000 hotels we integrated in 2018. “New Inventory” refers to the one announced in late 2018. The percentage showcases how much more you pay on Booking.com compared to LockTrip. Taking the 23% of Seoul as an example, it means that for a room priced at $100 on LockTrip, you would need to pay $123 on Booking.com. The analysis was conducted for the same places we included in our earlier analysis of 2018. This allows for a direct comparison. We managed to eliminate all the red numbers at the city level. Note that some individual hotels or rooms can still turn out to be more expensive. The numbers found represent an average and the full analysis includes 800 hotels across the world. There is a significant deviation between different cities and countries. For the region of Asia, we are improving our competitiveness by more than 15 percent points compared to our current offerings. Those numbers should be viewed as slightly conservative, since they do not reflect overlapping effects. Customers will always be shown the lowest price available from both inventory groups. Savings of the new inventory will thus be complemented by the old one where possible. We will be sharing a similar analysis for the regions of Europe and the USA once they have been completed. Stay tuned to not miss the news!